Rich, fudgy bars that are perfect for Fall. 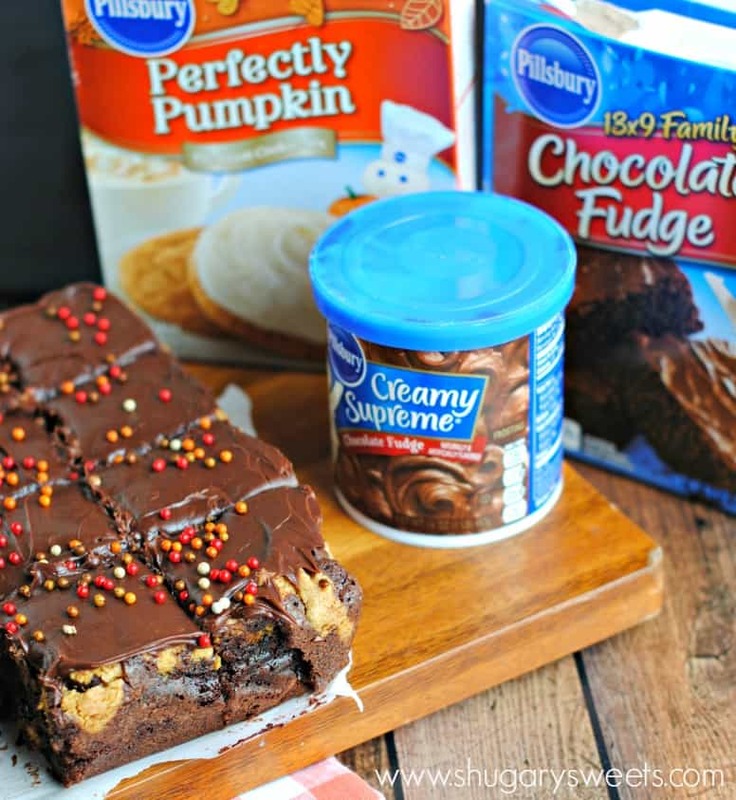 These Pumpkin Fudge Brookies are so easy to make using some of your favorite Pillsbury products! It’s no secret I love Brookies. You know…the “brownie cookie” combination?!? I love all the possible flavors you can make with this tasty treat. And today, I’ve not only made it a whole lot easier, but it’s also perfect for Fall. I’ve partnered up with Pillsbury to bring you some great holiday treats this year. While I love cooking from scratch, having a busy home life can hinder those plans sometimes. And who doesn’t have a pantry full of Pillsbury cake mixes and frosting? Have you seen the new holiday flavors on the shelves? The Pumpkin Cookie Mix? The Caramel Apple Cookie Mix? Today, you get to try (or I guess, drool) over these fantastic bars. I originally named these bars Pumpkin Brookies. But after trying them, and eating nearly the entire batch myself, I think the name “FUDGE” had to be included. From the fudgy brownie layer, to the rich Fudge frosting….these will leave your sweet tooth satisfied! And oh my gosh they are so thick too! Mine took about 40-45 minutes to bake, and they still had a little soft gooey layer in the brownie. Once you stick them in the refrigerator, this layer will harden and be like a fudge consistency. I’m telling you, make these today!! Seriously. Head to the grocery store, get what you need and make them today. Oh. Did I mention one lucky Shugary Sweets reader can win their own Celebration Starter Kit? This includes some Pillsbury product and a $100 Visa card. Thank you Pillsbury!! Be sure to scroll down past the recipe to enter the Rafflecopter form. So easy!! Good luck. For the brownie layer, combine brownie mix, oil, water and eggs in a large bowl. Mix about 50 strokes by hand. Fold in chocolate chips. Pour brownie batter into bottom of baking dish. For the cookie layer, combine cookie mix with melted butter and egg. Mix until fully blended. Fold in chocolate chips. Drop by tablespoon over brownie layer until completely covered. Bake in oven on middle rack for 40-45 minutes. It's okay if middle is not quite set. Cool on counter for 20 minutes and refrigerate for 4 hours, or overnight. When ready to serve, frost with Pillsbury fudge frosting and sprinkles. Cut and enjoy! Ready to win a fun prize? Be sure to enter the rafflecopter below to be entered! Visit Pillsbury on Facebook to vote for your favorite recipe name in the “We Bake it, You Name it” program!! Fudge brownie cookies?!?! WHOA. These need to appear in my kitchen immediately. So yummy! These look so delightful! I love this brookie! Cheesecake is my favorite dessert. These brookies look great! Date bars are my favorite today. Don’t know about tomorrow. Thanks for the giveaway. A bowl of ice cream. Sometimes it’s the whole pint! My favorite dessert is Red Velvet Cake! Every time I walk down the baking aisle in the grocery store, I want to buy ALL THE MIXES and play with them and make them into amazing desserts like your brookies. But then I don’t buy them. Next time, I’m gonna cave. These look too good to pass up trying! Oh my! These are so crazy thick and fudgy! I need to make them asap! Love all the layers! Pinned! My favorite dessert is cheesecake – I love to try different flavors! and also make them. These look great. Now I’m sorry I passed up the cookie mix at Target. Guess I need to go back!! These looks amazing! My favorite dessert is chocolate cake! My favorite is anything turtle. Ice cream sandwiches in summer and red velvet cupcakes any other time! I would have to say anything that contains chocolate would be an instant favorite! These look amazing by the way! Thanks for the giveaway!! I love a good cake, whether simple or elaborate. My favorite dessert is banana peanut butter pie. Um, instead of talking about my favorite dessert (why don’t I just pick a favorite child, it’d be easier), I just want to send some love out for these brookies. I love your brookies, Aimee. My all-time fave was your spooky brookies last Halloween. I made them again this year! 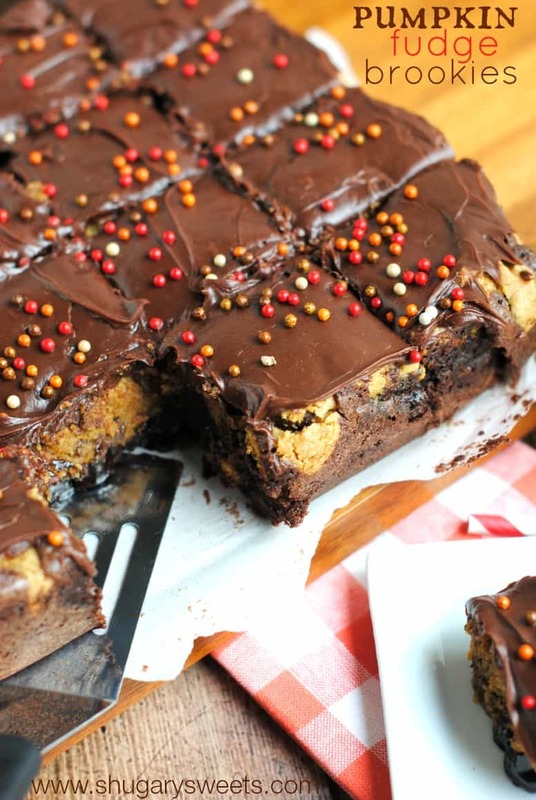 Cheesecake is my favorite dessert, but brookies are definitely in the top 5! Love the fall flavors-pinned! Sharing brookies WITH Hubby and/or Friends is my Fav! 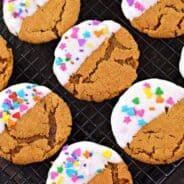 Anything with chocolate, I am a sucker for a really good chocolate chip cookie. Simple but makes me happy! I think my hubby would choose a chocolate chip cookie. Every. Time! Whoa girl, these might be the best brookies I’ve ever seen! So fudgy and gooey! Dying! Pumpkin and Fudge together makes me so happy. This is about heaven for me! 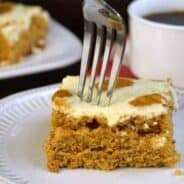 Pumpkin and fudge is a fantastic combination! I love how simple these brookies are. It’s a win for me! WHOA!! These look absolutely incredible! Oh yeah! Those look amazing! Picking a favorite dessert would be like choosing a favorite child if I had 100 of them, but anything chocolate is in my list of top ten favorites, along with cheesecake and creme brulee. Love how thick and fudgy these are! So good! My favorite dessert is double stuff oreos lol 🙂 but I like hot fudge cake too! Anything chocolate would be my favorite dessert and these look like a winner! Favorite dessert? Hmm….such a hard decision to make. If I had to pick just one item it would be chocolate cake. I love my chocolate peanut butter trifle…hard to stop eating! I love how easy and how ooey, gooey these brookies are!!! Pillsbury mixes totally rock!!! 🙂 What a yummy brookie reinvention! Oh, my. That dripping frosting reeled me right in! 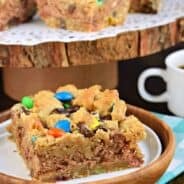 What a terrific twist on brookies! During the fall, I CRAVE warm apple pie with french vanilla ice cream. It has to be homemade pie though, the best! 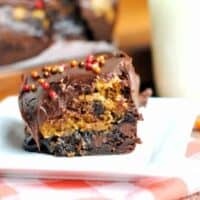 I love cheesecake but these fudgy pumpkin brookies may be my new favorite! Aimee these look incredible!! 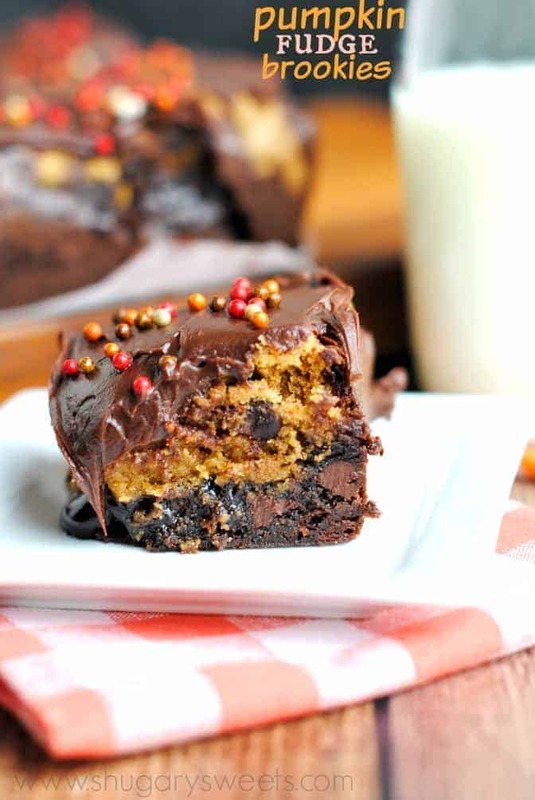 I love pumpkin and chocolate together, and I would go to town on these! I think I would eat the entire pan of these! Holy cow do these look good, Aimee! This is my idea of the perfect dessert!! I haven’t even eaten lunch yet and now all I am craving is a pumpkin brookie. I love this idea, Aimee! 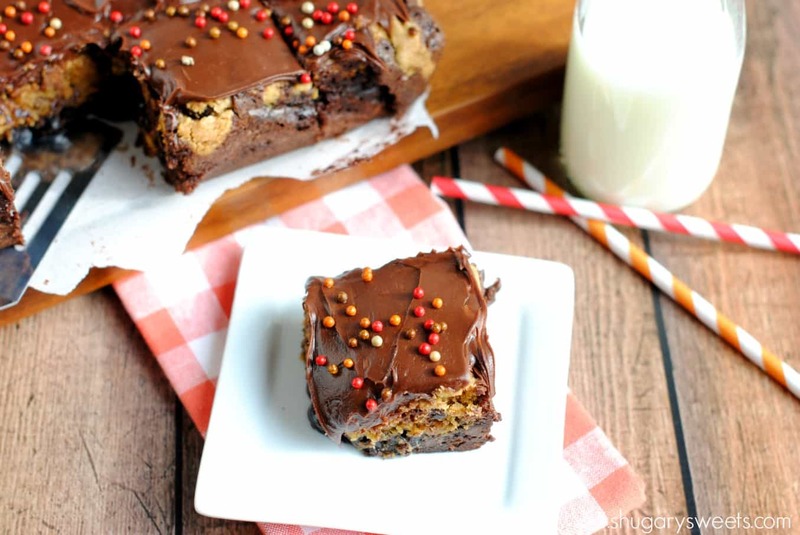 My fave dessert is peanut butter brownies!